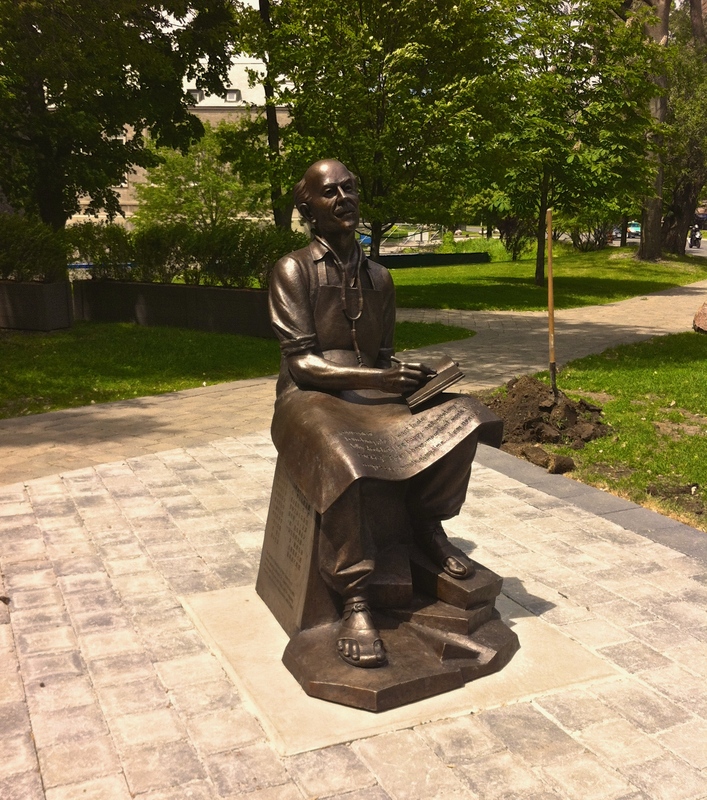 The life-size bronze sculpture of Dr. Bethune at the University of Toronto St. George Campus. The sculpture is inscribed with Dr. Bethune’s quote, ““… I am content. I am doing what I want to do. Why shouldn’t I be happy – see what my riches consist of. First I have important work that fully occupies every minute of my time… I am needed.” © Abtin Parnia. While a truly boundless graduate from University of Toronto (U of T), Dr Bethune is not a familiar name to most U of T students. A classmate of Dr. Fredrick Banting (co-discoverer of insulin, who is well known within the UofT community)1, Dr. Bethune was recently recognized at the University of Toronto by a sculpture made in his honour near the Medical Sciences building.2 Dr. Bethune is known within the medical community for his innovations in the treatment of tuberculosis and pioneering mobile blood transfusion.3 In addition to his scientific fame, Dr. Bethune’s selflessness and dedication to saving lives is widely recognized in China.3 However, in Canada it was not until 1972, 33 years after his death, that he was federally acknowledged as a “person of national historic significance”.3 Due to his membership in Canada’s communist party and his involvement in Sino-Japanese war Dr. Bethune is not seen as a national hero by all;4 nonetheless, his devotion to social justice and tireless advocacy for better health for the poor cannot be understated. The other interesting aspect of Dr. Bethune’s life is his role as a humanitarian. Dr. Bethune participated in three different wars, treating many injuries close to the battlefield. His medical innovation to create mobile blood transfusions and bringing this innovation near front lines saved many lives.3 However, due to his political engagement and his involvement with one side of the war, we may be hesitant to grant him the title of a humanitarian. As Dr. Orbinski suggested in his book An Imperfect Offering: Humanitarian Action in the Twenty-First Century, “To be politically neutral, you have to be the most political of animals.”7 Dr. Bethune’s membership in the communist party, involvement with the anti-facist movement of the Spanish civil war, and his work in China to support the 8th Route Army demonstrates the political nature of Dr. Bethune’s medical practice.3 Yet the practice of Dr. Bethune is still at odds with the humanitarian described by James Orbinski and organizations such as Médecins Sans Frontières (MSF). The idea that medical aid should be independent from “economic, political, and religious influences”8 is an effective approach when definitive lines between the oppressed and the oppressor are blurred- when civilians on all sides are victims of conflict. Today humanitarians are not able to be affiliated with one party and provide aid to these victims, as Dr. Bethune did. In today’s complex geopolitical landscape a humanitarian needs to remain politically neutral in order to serve all victims of war. Dr. Bethune may not fit the humanitarian definition of the 21st century, but remains a notable advocate for social justice and a hero in the struggle against poverty. University of Toronto alumni have made considerable contributions to different fields, and Dr. Bethune shines among these boundless alumni. The sculpture of Dr. Bethune is a symbol of the selflessness and dedication to all University of Toronto Students who wish to enable health for those in need. The Making of the Portrait Sculpture of Norman Bethune. Artist: David Pellettier. Producer, Director, Camera, and Editor: Adam Robert King. Li S. (2003). “BETHUNE, HENRY NORMAN,” in Dictionary of Canadian Biography, vol. 16, University of Toronto/Université Laval, accessed July 21, 2014, http://www.biographi.ca/en/bio/bethune_henry_norman_16E.html. Orbinski, J. (2009). An imperfect offering: Humanitarian action in the twenty-first century. Random House LLC.